The second-degree murder retrial of Dennis Oland in the 2011 bludgeoning death of his father Richard Oland resumes today in Saint John . Day #5 in the 2nd degree murder trial of Dennis Oland - accused of killing his father Richard following a visit to his office July 6, 2011. Paramedics Phil Comeau and Chris Wall are waiting in the hallway. Trial this morning to hear from paramedics who were called to the murder scene before it was known Oland was dead. First up is Phil Comeau. Comeau is a senior NB paramedic. 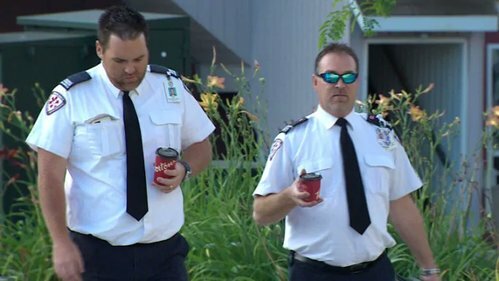 He’s president of the Paramedic Association of New Brunswick and says he has probably attended 75 to 100 crime scenes in his career. Patient care is always primary focus, says Comeau. But once it's determined patient care is not required, they're trained to leave without touching, disturbing the crime scene, he says. On July 7, 2011, shortly before 9 a.m., Comeau and Wall got a generic call - "gun shot, stab wound." They were parked just one street over on Germain St. having a coffee at the time, he says. Early confusion about what had happened resulted in the ambulance being dispatched to a “generic gunshot/stab wound” call at Oland’s office. Comeau says once arriving police were already there and people were pointing to an office door where help was needed. Comeau still was uncertain what kind of a call it was and asked what kind of equipment he would need. A bystander pointed them to 52 Canterbury St. They entered to find a long staircase. Comeau didn't see anybody, so he "yelled real loud a couple of times, 'Hello, hello anybody around?'" An officer came around the corner and said, "Up here," recalls Comeau. The officer (then-cadet Trinda (Fanjoy) McAlduff) said, "Bring everything, you need everything," says Comeau. But Const. Duane Squires then told them, "You don't need anything, just come up here," recalls Comeau. “Bring everything. You need everything,” Comeau says a woman shouted (likely Maureen Adamson) but at that point Cst. Duane Squires appears. “You don’t need anything,” says Squires. Comeau heads up into the office and is hit by a familiar odour. “The smell of death,” he calls it. “Not sure what it is but it stays with you,” says Comeau. Knee asks what Comeau noticed. "Overwhelmingly the smell," he says. At death scenes, there’s an odour any first responder can attest to, he says. "It's a lingering odour. I call it the smell of death. It stays with you for a couple of hours," he says. "It's something that hits you in the face and you know it’s there," says Comeau. He put on his gloves and entered the bloody office, where Richard Oland's body was face down in a large pool of blood. Trauma scene like that, he checks to see if rigor mortis has set in - a stiffening of the limbs caused by chemical changes in the muscles after death. "That’s incompatible with life so that’s all I needed to do," says Comeau. Comeau says it was obvious Oland was dead but he is obliged to check. He moves Oland’s foot to check for rigour mortis and it causes Oland’s body to move. That suggests to Comeau death had occurred a long while earlier. Comeau put his foot on the "patient's" leg - "When I did, the whole body moved and that’s a sign of rigor mortis," he says. Defence lawyer James McConnell asks if police ever requested Comeau submit the shoes he wore that day for analysis. No says Comeau. Is it true police did not take a statement from you for more than a year? 16 months says Comeau. Did you have some difficulty after that length of time recalling events of the day? Yes. Why did it take so long to get your statement? Not sure. Realizing this was a potential crime scene, based on the "look of the patient and the pooling of the blood and spatter," he left the same way he came in, being careful not to touch anything, he says. Knee asks how long he was in the bloody office. "30 seconds, less than a minute for sure." Defence lawyer James McConnell handles cross-examination. Asks whether there was blood spatter on the desk. Comeau says there was "quite a bit of spatter around. There was spatter pretty well everywhere." Next up Comeau’s paramedic partner that day Chris Wall. Is it true it was almost a year and a half before police contacted you to set up interview? asks McConnell. Comeau says he thinks it was about 16 months. McConnell suggests it was Nov. 1, 2012. Comeau doesn't dispute that. Wall was new to the job at the time. He too was struck by the smell which he had been told about in school but had experienced only “once or twice” before that day. Nothing was to be done and both Wall and Comeau left after a couple of minutes but the visit stuck with Wall. “I was in shock because that was the first time I had seen that,” he tells crown prosecutor Jill Knee. About 3/4 up the stairs to Oland's 2nd-floor office he too was struck by an odour. It's hard to describe, he says. In school, they teach you - you’ll know when you get a smell like that, says Wall. Comeau and Wall talk through what they’ve seen but are soon recalled to deal with Preston Chiasson who is in some distress after his own viewing of the murder scene. He was behind Comeau, but very close, a hand's distance away, he says. Once they realized there was nothing they could do, Wall says he turned around and walked out. Why? asks Knee. "I didn't want to step on anything that I shouldn’t have, didn’t want to bump into anything that I shouldn’t have," he says. James McConnell asking Wall now familiar questions about possible crime scene contamination. Wall estimates he was only in the office "a minute and a half, maybe two minutes, tops." He was in shock afterward, he says. It was the first time he had ever seen "that kind of thing." Police ever ask to check your footwear? No. Was it a long time before police got a statement from you about that day? Yes. Defence lawyer James McConnell asks Wall if he stepped in the "extreme" blood he had described seeing. "I would have done whatever I could not to step in it. I can’ t say 100 per cent that I didn't." Did you check your footwear for blood? asks McConnell. No. Did police ever ask you for your footwear? No.